NM State Match - 2018 Buffalo Stampede - is pounding down the valley toward September! Planning is heavily underway, entertainment and a major food vendor have been confirmed, applications are flowing in, web site additions have been made, and sponsors are providing support! Don't get left in the dust! Garrison Joe, Pres. BRR Club Memberships are due for renewal. We're retaining a lower price again this year, $20 for individuals and $35 for family. You can send in a renewal (or new application) or complete one at the next match you attend. At March match, the "member match fee" applies only if your membership is current. 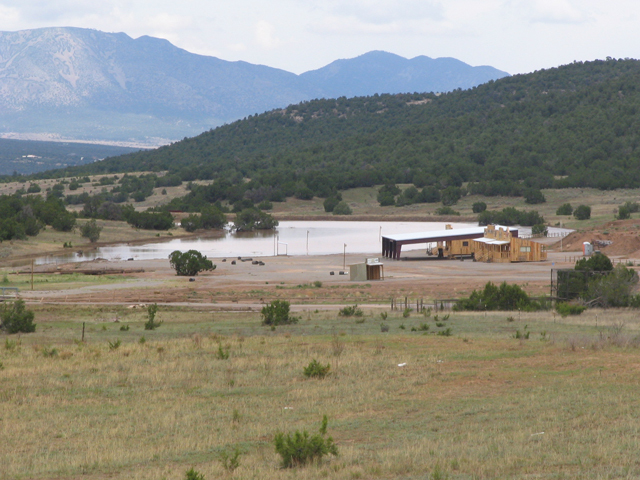 The Founders Ranch expanded use permit was upheld in court and this case has been closed. That is good news for continued operation as normal for Founders Ranch and Buffalo Range Riders. The scores now include a spreadsheet you can download for details of the match results. Our application will be reviewed and a decision made during the next scheduled meeting on Jan 9th, 2013 at 9:30AM. The meeting will take place at the Torrance County Government offices in Estancia, NM. A planning and zoning meeting for Founders Ranch is set for the morning of December 5th...a week from today, in Estancia , NM at 9 am . Be there to support our facilities, and tell those who enjoy it as well....no need to be a SASS memeber to show support! The address is 205 9th Street (turn West on Loring and travel 5 blocks...you will be at the building) This is the OLD courthouse!! You need not dress in SASS attire, but you may if you choose! Presence is important....and we know this is in the middle of a work week. We hope you can make this, and if not, maybe someone can attend in your place! Hope to see many folks there. Phone contact is 505-246-4759. Torrance County Planning and Zoning. We would like to recognize the following White Buffalo (Clean Match) BRR Members from EoT 2012. Edward R. S. Canby, Lt. Daniel Lee, Mica McGuire, and Texas Tiger. Congratulations to the following BRR members for outstanding shooting!!!!!!!! End of Trail 2012 is over. What a great shoot with many wonderful changes. A list of the top Buffalo Rage Riders will be listed soon. A special congratulations to Singin' Sue our newest Regulator. Her dedication and hard work is much appreciated. Thank you Singin' Sue!!! Cops and Cowboys scores are are on-line. April 1, 2012 monthly shoot starts the summer times. Signup starts at 8:30am and shooting starts at 9:00am. This will be a six stage match. Lunch will be available for about $7.00 a head. At this match only - a Raffle for a free entry to EOT! The BRR club will be raffling a buy-one-get-one-free main-match entry to EOT. $1 a ticket, must be present to buy, must be present to win at the drawing at the end of the match and awards ceremony. Of course, if you don't plan to go to EOT and have a spouse, family member or friend who would like to go for free, there is not much use to buy a ticket or 10. But, it could save the lucky winner up to about $250. We will still be collecting and finalizing nominations for officers for 2012, for election at the June match. If you want to nominate someone, please get their agreement. And, as always, visitors or first-time shooters are warmly welcomed! Bring your own safety glasses and ear protection for best comfort. October scores are are on-line. Congratulations to Boggus Deal, Top Overall. Remember it is day light savings!!!!! Note 2: Our lunch caterers will be present! $7 gets you a hot lunch and cold drink. Exact menu to be announced at sign-in. Note 3: Remember that the Club is not providing bottled water for shooters. So, bring your own thirst quenchers, too. (No alcohol, of course, before or during shooting events.) And no prescription or other drugs that impair your ability to shoot, of course. This will be a six stage match. We have had folks express interest in holding a swap meet or White Elephant sale during this match. LouAnn Ehret will be the swap meet manager, present all the time to make sure youur goodies don't walk off. Price your merchandise that you would like to sell, and it will be "on inspection" in the Belle Union during and after the match. Sign a price tag to show you want an item, and find the seller after the awards ceremony to settle up - cash or local checks only please. Bring all those pieces of gear that no longer get used, and help them find a new home. October scores are are on-line. Congratulations to Mica Mcguire, Top Overall. Please join us for this good cause. Due to a Outlaw Trail the BRR October monthly match has been moved to October 16th. That is the 3rd Sunday in October. More details to come. Please keep checking the blog for current information. September scores are are on-line. Congratulations to Rich Diamond, Top Overall. August scores are are on-line. Congratulations to Mica Mcguire, Top Overall. The new shooters clinic is getting full. Please contact Prairie Mary at prairiemary48835@gmail.com. Reserve a spot today. If you have a freind that is interested in SASS this is the time to show them how much fun it is. A new shooters clinic is scheduled for September 3rd (Saturday) from 9:30am til 12:00pm at Founders Ranch, New Mexico. It is limited to the first 12 signups. If you are interested and would like more informtion please contact Prairie Mary, 505-249-3573. Please call and reserve a place today. The August 7th monthly BRR action match has been moved to the third Sunday, August 21th, due to the Ruger Rimfire Challenge. Our summer shooting times will remain the same. Hope to see you there. July scores are are on-line. Congratulations to Mica Mcguire, Top Overall. June scores are are on-line. Congratulations to Mica Mcguire, Top Overall. December scores are are on-line. Congratulations to Johnny Tucker, Top Overall. At the November Match we will have a pot luck dinner and prize give away. Congratulations to Deadwood Doc Smith and to Buckeye Lady our top Mens and ladies winner. Don't miss the October Match. It will be October 7th. September Newsletter is on line as well as scores for the September Match. Don't miss the September Match. We will be riding the Outlaw Trail. The August news letter is now on line. 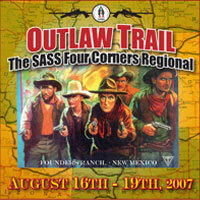 Outlaw Trail - SASS Four Corners Regional is August 16th - 19th. FOUR GREAT DAYS of SHOOTING! The August Action Match will begin at 9:00 AM and Registration will begin at 8:00 AM. This time change will last through the summer months. July Match scores are posed online. Congratulations to Goatneck Clem and Half-A-Hand Henri as our mens and ladies overall winners. Even though it is only a few days after EOT we will be shooting on July 1st. Come and see what you missed or see if you can better your EOT scores. We should have a big match, hope to see you there. June Match Scores are now posted online. Congratulations to Long Hunter and to Half-A-Hand Henri as our mens and ladies overall winners. Starting the 1st Sunday in July Mounted will start at 10AM for those who wish to come early to Warm Up. The four stage Match will start at Noon. Also, there is only a few days to EOT Mounted will be shooting on June 3rd. Come and warm-up for EOT. Even though it is only a few days to EOT we will be shooting on June 3rd. Come and warm-up for EOT. We should have a big match, hope to see you there. The May Scores for Action and Mounted are posted. New Mexico State Championship is April 26th - 29th. The April Mounted match is rescheduled for April 21 at Founders Ranch. Hopefully the weather will be better and so will the arena conditions. The April Action Match Scores are now on-line. Congratulations to Half-a-Hand Henry & Dirty Dan our overall Ladies and Mens Winners. The April Mounted match in March 31st and the Action match is set for April 1st. We need help setting up on March 31st. Barton Gate will be open early. The March Newsletter is now on line. Congratulationa to BRR Mounted Members, Sierrita Slim won Mens Division 1 and moves up to a 2, Mac the Knife won Mens Division 2 and Buckskin Doc won Mens Divison 3! Morning Dove was 3rd in the Junior Division. Congratulations to Billy Boots and Amber Ale our men's and ladies overall winners. this month. The January Newsletter in now posted on line. The Action and Mounted Matches have been canceled for Feburary due to weather conditions at the ranch. The 2007 Action and Mounted Schedules are no on-line. The November /December Newsletter is now posted on-line. The November scores are on line. Congratulations to Crazy Kirt and Sweet Becky Sue our men's and ladies overall winners. The October Newsletter is now posted on-line. Congratulations to Bogus Deal and Amber Ale or men's and ladies overall winners. The last BRR Action Match, of the season, will be held Sunday November 5th and along with it we will a pot luck dinner and out end of year celebration. It is not to be missed. This Sat. Oct. 28th is our last practice of the 2006 season. We are having a New Shooters Clinic starting at 10:30AM at Founders Ranch. Cost is $35.00. Come early to warm up. We will also have our 3 stage Mini Match at 2PM. This will give you a chance to accumulate some last minute BRR points for high point winner. Be sure and mark on your calendar our end of the year Mounted BRR dinner on Dec. 2nd at 2:30PM at Chili Hills restaurant in Edgewood, NM. Cost per person is only $5.00. We will have a prize pool for every member to participate in. Also, high point Cowgirl and Cowboy award will be given out. The BRR Mounted Match will be held Saturday September 30th and the BRR Action Match will be held October 1st. The September Newsletter is now posted on-line. Congratulations to Long Step and Lady Long Step the New Mexico State Champions. The August Newsletter in now posted on-line. Remember, NO MONTHLY MATCH THIS MONTH. Also remember the New Mexico State Championship is September 15,16,17, 2006. It is hosted by the Magdalena Trail Drivers. Reminder - No September Monthly Match. Just a reminder that there will not be a BRR Monthly Action or Mounted Match the first weekend in September. Smoke in the Valley will be held that weekend and all are invited to participate in the Southwest Territories Regional - Smoke in the Valley. We will have our regularry scheduled match in October. .
August scores are posted on line. The August scores are now posted on line. Congratulations to Bogus Deal and Annabelle Peacock as our top men's and women's shooters. A job well done. July News Letter is posted on line. 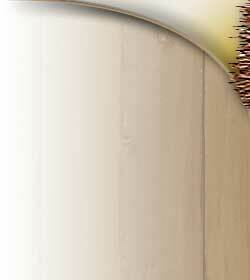 The July News Letter is now posted online. Along with all scores and information about the upcomming Smoke in the Valley. The BRR Mounted Scores are posted for the June and July 2006 match. Next Match will be Sunday August 5th. A Treasure Chest of fun at Smoke in the Valley. You are sure to find a Treasure Chest of fun at Smoke in the Valley. Register now and begin working on yer pirate outfit, parrots are optional. All of the stage at Smoke in the Valley will be based on a Pirate theme. So, it is time to open the Dead Man's Chest and send a few souls to Davy Jones Locker and by the way ....Drink up me hearties YO HO. Saturday August 5th, will be a workday for BRR Action Club. We will be assessing the damage by the most recent flood. (See the photo) We will also be assembling the picnic tables that we donated to the Ranch. The next meeting of the BRR Mounted will be Saturday August 5th. The BRR Action club will have a workday on August 5th and Monthly Match will be Sunday August 6th. Smoke in the Valley to host 1st Buccaneer Ball Saturday night. Avast maties, it's time to get yer pirate digs out for the very first annual Pirates Ball. Bring you parrot if'n ye wish but bring plenty of rum. There will be a costume contest that will be judging the best Pirate and the best Winch...err excuse me, I meant "Beauty." Only the lowest bilge rat would not attend, so we'll be looking for ye. The third annual SASS Smoke in the Valley this year will be the new Southwest Territories Regional. It is not just a "Black Powder Match" any more. There will be a the International Black Powder Shootout held on Wednesday August 30th. All SASS members are invited to participate. This year the theme, will be Pirates. All of the stages will be based on Pirates and there will be a Buccaneer Ball on Saturday Night. Complete with best dressed Pirate and best dressed Winch. It promises to be great fun. Hope to see you there. SASS creates new award for hard work on Founders Ranch, "Top Ranch Hand." SASS has created a new award for the hard work turned in by volunteers at Founders Ranch. 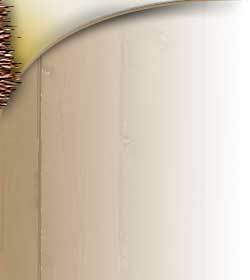 The award is called the Top Ranch Hand. The recipients for this year are Stokes Dogbitter, Timberwolf Annie, More or Les, Giggles, Doc Drillem, Crazy Kurt, Larime Jack, Pistol Packing Granny, Jack Diamond, Crotchety Ol Bart, Mal Ojo, Ten High, Adobe Walls Shooter, Honey Hush, Grumpy in the Morning, Hard Luck Hanna, Hickory Stick. Thank you all for such dedication and hard work. Of the many Awards given at END of TRAIL we had many of our own Buffalo Range Riders Honored Sieritta Slim was given the "Spirit of the Game" award, which he shared with his family. We also had several new regulators that are Buffalo Range Rider Members, they are Nuevo Mike, Cinnamon Lucy, Giggles, Sierrita Slim and Rancid Roy. Longhunter was high overall for men and Annabelle Peacock was high overall for ladies. We had a record of 42 shooters for our June Match. Rio Grand Glen was the overall winner of the May Action match. Pistol Packin Granny was the ladies high overall. We had 28 participants for the Action Match. The April newsletter is posted on line wih all the scores and club news from this month. We will be working on the Western Town begining April 20th and will also be setting up the Founder Ranch Invetational Match April 23rd an April 24th. All help is appreciated. .
We have began construction on the western town. The footings have been poured and framing will start on Thursday April 20th and continue through the weekend . The Second SASS Founders Ranch Invitational and Mexican Fiesta will take place at Founders Ranch, April 27-30, 2006. The annual event is hosted by The Buffalo Range Riders Action and Mounted Clubs. All SASS members are invited to participate. This year the theme, again, will be a Mexican Fiesta complete with Mariachi Band, best dressed Charro & Charra contest, and great Mexican food. Again we will have our "Silent but Deadly Auction" to benefit the Western Town at Founders Ranch. Hope to see you there. The April Scores are posted on line. Don't forget the next Monthly Match in May 6th for Mounted and May 7th for Action. Mounted has good practice April 1st. We had a great time on Saturday, there were 7 brave souls who faced the uncertain weather. A warm welcome to our newest member, Toro Loco. A big THANK YOU to Sierrita Slim for helping set up the new rental stalls. These stalls will be available for rent to all overnight campers, the cost is $10 a night. The April Action and Mounted matches will be on the first weekend in April. Mounted Match will be on April 1st and the Action Match will be on April 2nd. See the Calender Page for more details. The March Action Match was a great success and Crazy Kurt was the overall match winner. We had winners in ten different categories. See the Results Page for all scores and winners.